Enjoy a vacation of luxury in this absolutely gorgeous North Myrtle Beach oceanfront penthouse. Enjoy the Ocean Drive Difference by starting your vacation immediately upon arrival, as this property comes with fresh bed linens/bath towels, the beds are already made up for you, and the departure maid service are all included in your price. 1603 at Windy Hill Dunes features a spacious interior with 3500 square feet of living area! Experience ocean views from the floor to ceiling windows in the living room, library, dining room, gourmet kitchen, and most of the bedrooms. Granite countertops nicely accent each bathroom and kitchen. Cool tile flooring runs the length of the entire property. The amenities featured in this premier penthouse include 55" flat-screen TV in the living room with DVD player, 32" flat-screen TV/DVD combo in all 5 bedrooms, WiFi internet access, fully functional digital piano, wet bar with wine cooler, electric fireplace, Bose CD player, classic family games, jacuzzi tub in the master bedroom bathroom, and a long, 52 foot oceanfront balcony. An executive desk compliments the library, a perfect spot to catch up on some reading on vacation. Windy Hill Dunes provides lots of amenities for guests staying with Ocean Drive Beach Rentals. Adults and children alike will love the lazy river, swimming pool, kiddie pool, and hot tub - all of which are located outside. There are four large egg-style smokers/grills located on property. Free parking, with an air-conditioned walk-over the boulevard, and glass elevators with views add to the comfort level for visitors. 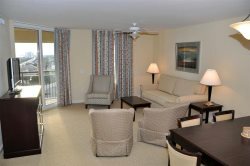 Guests staying at Windy Hill Dunes 1603 can take advantage of a private beach access to the beautiful wide, sandy beach of North Myrtle Beach. Windy Hill Dunes is conveniently located close to all the popular attractions in North Myrtle Beach. Hundreds of top-ranked golf courses lie within a half hour's drive from the Resort. Name brand stores and local specialty shops are just a short drive down the road!